When it comes to cooking meals, there is nothing I dislike more (other than dirty dishes) than trying to choose what to have for dinner when it is already 5:00…6:00…7:00, yikes! When that time of the day strikes with no meal plan, eating out or take out tends to happen more often. I feel confident saying you too know this all too well. As someone who consumes a plant-based diet and living in a town where plant-based dining is hard to come by, we rely even more on meals at home. Throw a 6-month baby girl in the mix, and eating at home becomes even more important. Affordability: Cooking your own meals is much cheaper than eating out! Even running through the drive-thru can add up significantly. Healthier Choices: Individuals tend to choose healthier options when cooking at home. At home, you can control not only how much, but what is in your food. Food Safety: Cooking at home doesn’t eliminate food borne illnesses, but it dramatically reduces the risk as you have control of how your food is cooked and stored. Encourages Family Bonding: Sure, a family can sit down together when out to eat. But eating at home not only encourages family dinners, but also encourages children to learn cooking skills—a lifelong skill! Control of Food Allergens/Sensitivities: For those with food allergies/sensitivities, eating in allows families to control what ingredients are used in meals. Many are aware of the advantages of cooking and eating at home as a family, however, many struggle to make it happen. Commonly, patients tell me cooking at home is difficult due to lack of time. Although meal planning does require some time upfront, you’ll find proper meal planning is relatively simple and can lead to slimmer waistlines, decreased groceries bills, less stress, and ultimately time saved! Who doesn't want all it has to offer?! 10 tips for effective and stress-free meal planning! 1. Know where to go for recipes. One of the biggest questions I am asked regarding recipes is where I find them. All over the place! However, I have several of my favorite cookbooks within easy reach in the kitchen. The ones I use less frequently are in the kitchen, but a little more than an arm reach away. If your cookbooks are stashed away, you’re much less likely to pull them out or even know what recipes are in there waiting for you. In addition, I frequent food blogs and save recipes I’m interested in trying to boards on Pinterest. I also have a board for “Keeper Recipes” to remind myself which recipes were loved enough to make again! 2. 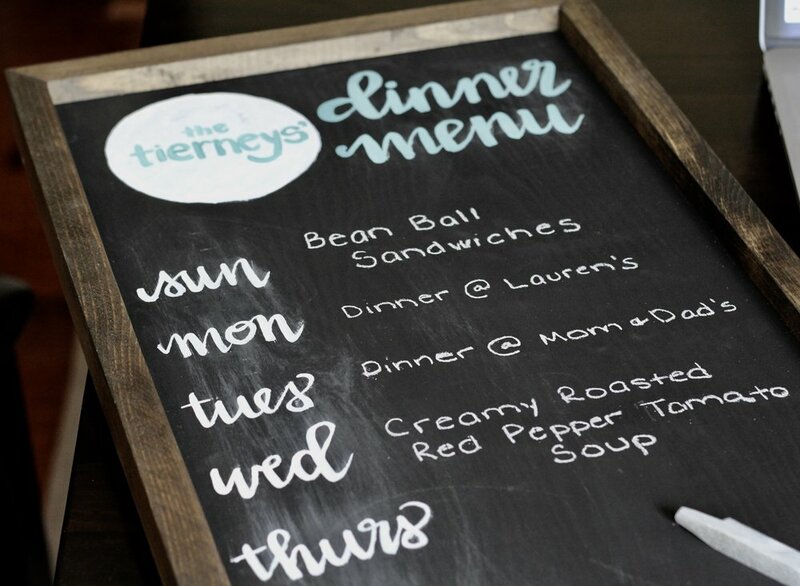 Have a calendar, board, or a simple piece of paper to keep track of what’s for dinner. You think you’ll remember what you planned for dinner on a certain night, but you won’t. This list can be as simple as a post-it note, a sticky note on your computer desktop, a dry-erase board, or chalkboard dinner menu. We just updated our board to a chalkboard menu from LoveMeSomeBoards! We love this rustic wooden sign and how it perfectly matches our style. Not only would a board help you remember what's for dinner, but it will allow your family to know what’s for dinner—hopefully so they can start the cooking process if you aren’t home yet! 3. Know your/the family’s schedule for the week. Let’s face it--you most likely won’t eat at home every night. Plus, with busy schedules, who is home for dinner will most likely vary. As important it is to sit down and eat meals together as a family, it most likely doesn’t happen every night. At our house, the type of meal depends on if both my husband and I are home for dinner. If it’s just me (and Baby Girl), I will most likely choose a recipe that requires less time. I’ll save the more time intensive recipes for a night my husband is home, or for a weekend night. If we know we are going out to eat or have dinner plans away from the home, I will indicate that on the menu board. 4. Meal plan IN your kitchen. 5. Make your grocery list as you plan. Leftovers are a crucial piece of cost and time savings! Be sure to estimate how many servings a particular meal will make. If there are two of you at home and the recipes makes four servings, you can either plan the leftovers to be lunch or dinner the next day. You don’t have to make a homemade meal every night! Let’s face it, there are several types of foods that freeze extremely well—especially soup! If you know you love a certain recipes that freezes and reheats well, double the recipe! If you’re already chopping and using cooking times, you might as well make another batch for a meal in the future. We love making Pasta Primavera in double batches and freezing one batch for later. Boil whole wheat pasta, reheat the sauce, and viola! 8. Meal prep in advance, if able. Some meals might be more time intensive, however, some steps could be completed several days in advance. Making a soup that requires chopped veggies? Chop them on Sunday! Making a homemade pizza? Make the dough in advance and refrigerate or freeze earlier in the week! Making granola that is simple but requires a long duration in the oven? Make it in advance when you know you’ll be around the house for several hours. Did someone say laundry day? Sometimes people associate meal planning with long, drawn out recipes. Who says? Meal planning can be as simple as “Monday: Baked potato, frozen broccoli, and fruit.” If you want to try a time intensive recipe, save it for a day you know you’ll have time. 10. Make it a habit! As I mentioned before, meal planning can require some time upfront. However, the more often you meal plan, the easier it gets. That is the same for other healthy habits. Choosing a day of the week you will meal plan and grocery shop and sticking to it (with some flexibility) will make the whole process easier and simply become part of what you do. To get you started on some great meal planning or to add beautiful rustic boards to your home, LoveMeSomeBoards is offering Wholesome readers 20% off any boards through April 30th, 2017 when you order from the Etsy Shop. Use the promo code: WHOLESOME to redeem this offer. My meal planning helper, Baby Girl!